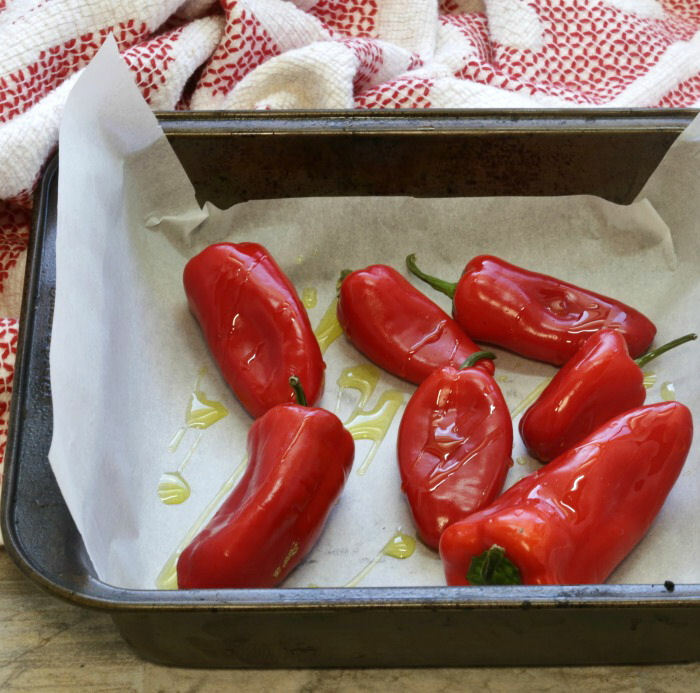 Roasting red peppers is super easy to do and gives you a great tasting result that is so different from the pepper’s natural taste. This cooking tip gives you four ways for roasting peppers and works with both sweet bell peppers, and spicy chili peppers. If you have never eaten a roasted red pepper, fresh from the oven, you don’t know what you are missing. The baking process brings out the natural sweetness of the peppers. You can eat them as they are, for a snack, or use them in other recipes to impart that natural sweet taste. See my tips for roasting other vegetables here. 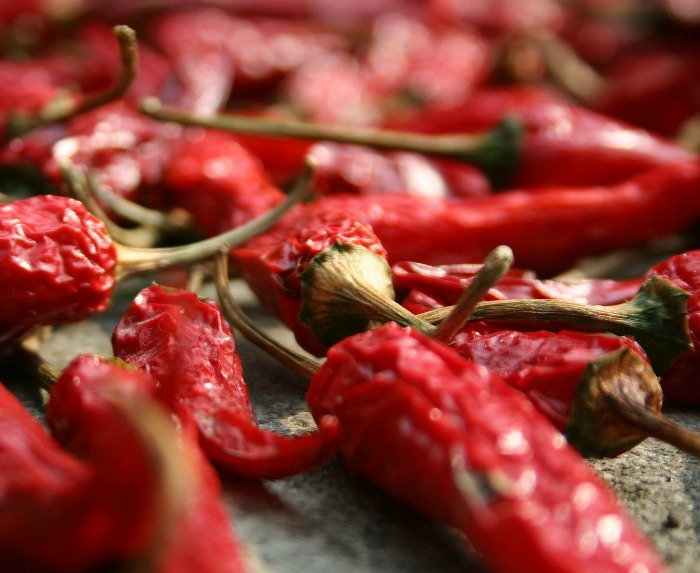 When you roast red peppers in the oven, especially spicy ones, it allows you to easily remove the outer chili pepper skin and changes the pepper flavor. It makes them soft and perfect for stuffed pepper recipes. This roasting can be done with peppers on their own, or loaded with tasty fillings like these barley stuffed peppers. Either way, the sweetness of the peppers comes alive! There are lots of places that sell roasted red peppers but they don’t hold a candle to the ones that you roast at home, especially in terms of texture and flavor. 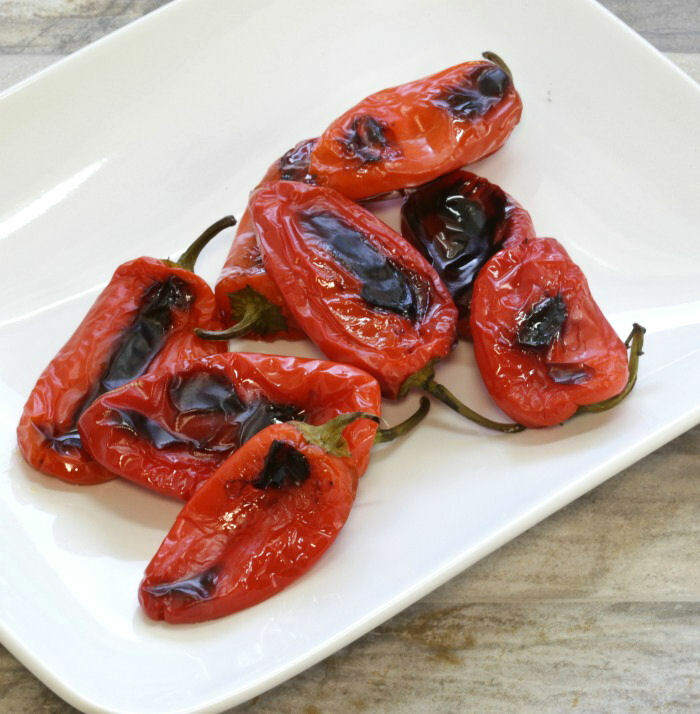 For such a great tasting flavor, it is surprising how easy it is to roast a red pepper. All they need are a bit of seasoning and some olive oil and heat. Red peppers can be roasted whole or sliced and cleaned. I normally cut the larger ones in half and remove the stem and seeds, but I just place the baby peppers whole in the oven, since they don’t have many seeds. Line a baking pan with parchment paper and place the whole baby peppers on the paper, or the whole peppers, cut in half, cut side down. Season very lightly with some sea salt and cracked black pepper and drizzle the peppers with extra virgin olive oil. Roast the peppers in a pre-heated 450 º oven for about 25 minutes (less for the babies) or until the skins are wrinkled and the peppers are charred. Enjoy the peppers as a healthy snack, or use them in recipes to infuse lots of lovely flavor. I don’t bother peeling baby peppers but do with the larger ones. To peel the peppers, just let them cool a few minutes until they are comfortable enough to handle and then peel the skins off and discard them. They should peel off easily if you have cooked them the correct time. Roasted peppers will keep for 1-2 weeks in the fridge if you cover them in olive oil or about a week just roasted in an air tight container. They also freeze well. Just place them in zip lock baggies and store in the freezer for up to 3 months. It is so easy to make roasted red peppers, that you can do them as you need them, just a few at a time. If you know you’ll be using them a lot this week, cook a big batch of them on Sunday and keep them in the fridge to use in your recipes all week long. It’s a GREAT way to use up red peppers from home grown plants that are producing all at once! 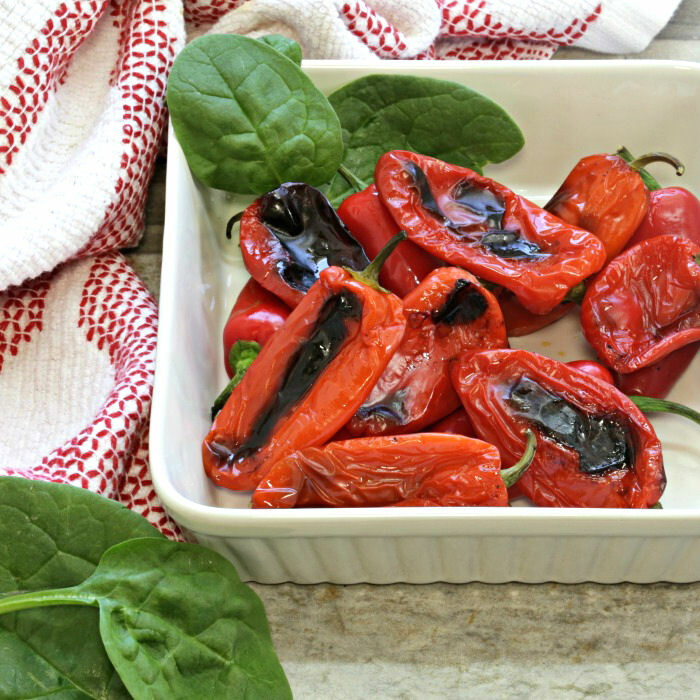 What do homemade roasted red peppers taste like? Sweet roasted peppers are naturally low in fat and sugar and have only about 25 calories for 2 small peppers, which makes them an ideal food to snack on. 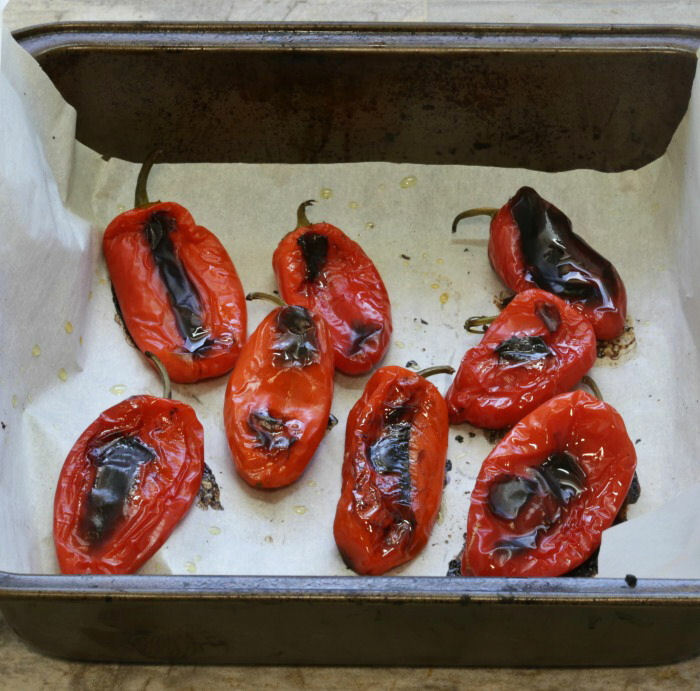 The oven is not the only way that you can roast red peppers, although it is my favorite way. 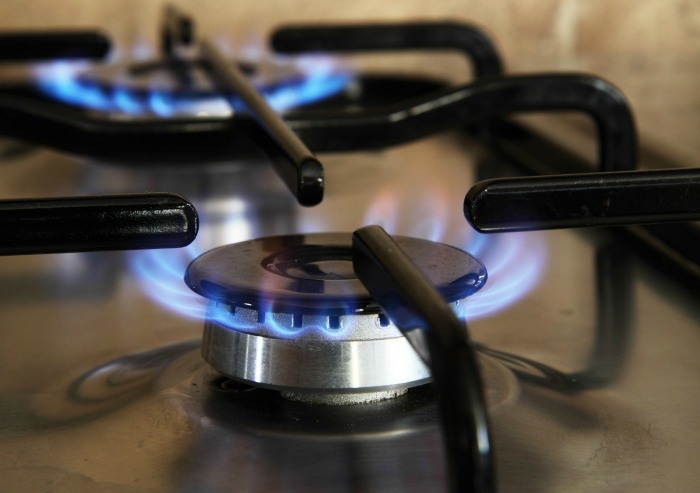 You can also use a gas stove, a gas BBQ grill, or your oven broiler to get a similar result. If you are in a pinch for time, when cook them with gas the peppers will roast more quickly since they will be exposed directly to a high heat. To roast a red pepper on a gas stove, just turn the gas burner on to highest setting and lay the pepper right over the flame. You can turn the pepper with tongs until the skin is charred and blackened. The heat will give it a similar roasted flavor to those baked in the oven. Oven roasted red peppers retain more of their natural flavor than those which are charred on the stove or on a grill. This is because the hotter the heat source, the more you affect the actual pepper itself. It is faster but you can easily over do the heat. 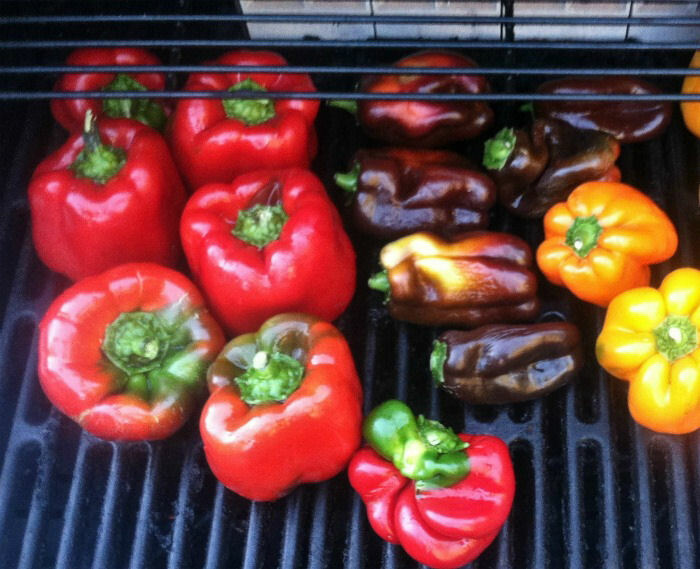 You can also use the broiler in your oven to roast any type of peppers. Just line them up on a broiler pan, season and drizzle with oil and cook about 8-9 inches away from the preheated broiler element. Cooking them this way is faster, but chars them much more than normal roasting does. You’ll have to watch them carefully to make sure they don’ t burn too much and may have to turn them during the cooking time. I use roasted sweet bell peppers in so many ways. They are great in soups, sandwiches, on pizzas, in omelets or scrambled eggs and in dips. They make a nice topping for home made crudites, and I love using them as something extra on an antipasto platter. Enjoy your freshly roasted roast peppers! 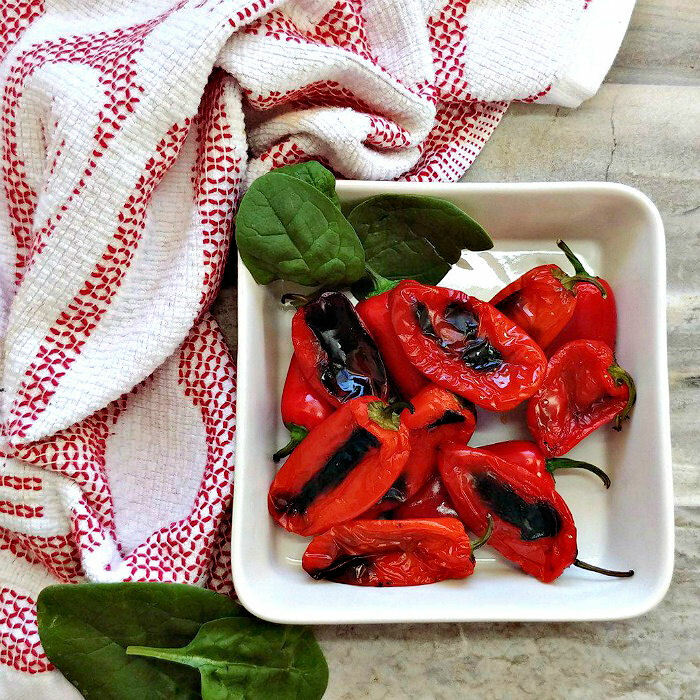 Roasting red peppers brings out their natural sweetness. They are very easy to do and can be used in so many ways. 10 Baby Red Bell Peppers (can also use yellow and orange babies, or whole Bell peppers of any color.) Spicy chili peppers will also work. Preheat the oven to 350- 450 º degrees. The hotter the oven temperature, the more char you will get but they will need to be closely watched. Line a baking pan or cookie sheet with parchment paper. Add the baby peppers whole, or cut the larger ones in half, remove the seeds and stems and place them cut side down on the paper. Season very lightly with salt and pepper and drizzle with olive oil. Place in the preheated oven and back until the skins have wrinkled and the peppers are starting to blacken. Time depends on the cooking temperature, but I start checking them after about 20 minutes. I don't mind the charred skins, since I don't make them too black, but you can easily peel the skins off if you do. The delicious roasted flavor will remain either way. Eat these as a snack or use in recipes. They will keep for about a week in am an air tight container the fridge. 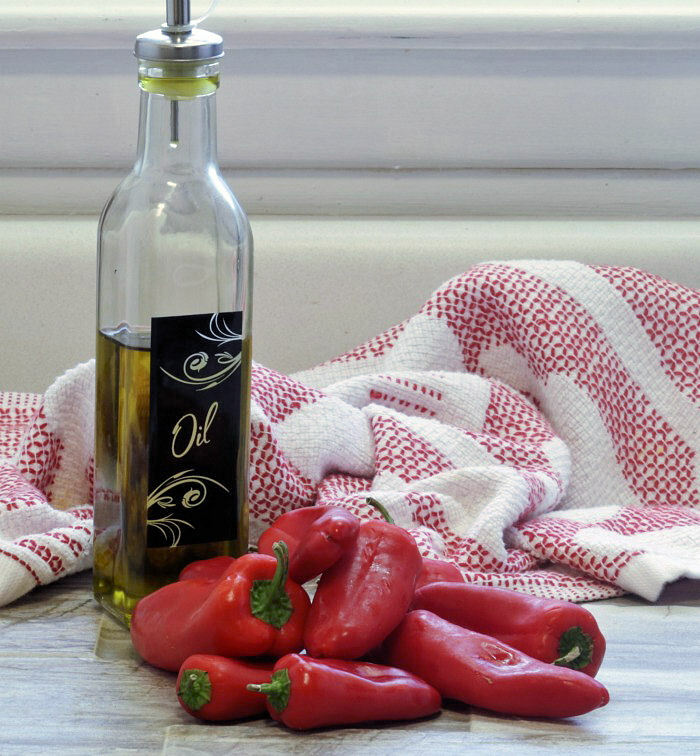 If you are not using them right away, add some olive oil to the container.